Home » Faith » Why does God take us to the edge? Have you ever wondered that? Why is it that God takes us so close to the edge so often? I mean, isn’t there an easier way? The theory of course is pretty straightforward: because He wants to grow our faith in Him, right? That’s the theory! Now I don’t know about you, but the theory is pretty hard to chew on when you’re out there on the edge facing some crisis; a set of absolutely overwhelming odds. The story that really blows me away – and stories are the way God takes my learning way beyond the theory straight into the realities of my life – is the story of Gideon. Remember we chatted about him in my previous post – Fear and Courage Two Sides of the One Coin. Not only was he facing an army so overwhelming – numbering in the hundreds of thousands – that the odds of winning were completely impossible, but God then whittled Gideon’s force down from over 32,000 men to just 300! Now maybe Gideon was made of sterner stuff than me, but I have to tell ya, I would’ve been asking God What the blazes are you thinking here? Now at first, that may not be particularly comforting. Seems that one of the reasons God takes us so close to the edge is so that He gets the glory. But we live in a world where we’re all too prepared to reinvent God in our own image; to reduce Him in effect to our buddy, our mate, the One who does stuff for us when we need Him to. Almost like a slot machine, sugar-daddy kind of God. After all, I’m at the centre of the universe aren’t I? God serves me … doesn’t He? See how our “me” culture warps our view of God? But what use is a God who’s been reduced by being remade in our image, when we’re faced with completely overwhelming odds? One of the things we relearn and rediscover when He calls us to live a life on the edge is that He is a mighty, awesome, sovereign, powerful God – capable of anything. He is the God who holds the universe in the palm of His hand. And He doesn’t share His glory with anyone. Ever. Now, we may well know that in theory, but this is something that you and I need to learn in practice. But why? 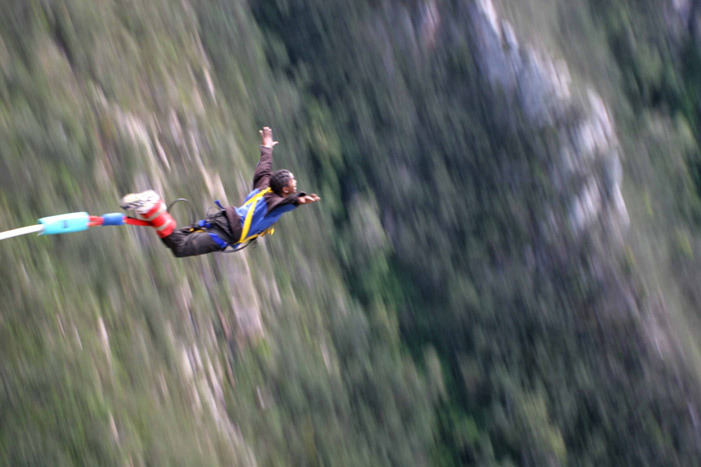 Why does God take us or allow us to go to the edge? That’s the $64 dollar question isn’t it. Why? Especially when we’re out there. I can see lots of reasons why, from my own experience. Out there on the edge is where I really came to know God. Not just know about Him. But actualy know Him in my experience. It’s out there on the edge that we learn what faith is. It’s out there on the edge that we discover the faithfulness of God. It’s out there on the edge that we learn to let go of our reliance on “stuff” and discover the joy of placing our lives into the hands of the one who is faithful beyond measure. Putting our trust in a trustworthy God, despite the alarm bells that are ringing and despite what our circumstances are screaming at us, doesn’t come naturally. It only comes supernaturally and I know that in my case, it’s taken quite some practice … with yet more required. I never ceases to be amazed at the fact that God didn’t even spare His Son from suffering. It seems that love and suffering go together. And at the end of the day, my hunch is that God wants us to learn the lesson that Job learned. He suffered incredibly and asked God “Why?” over and over again. God is sovereign and His ways simply don’t always make sense when we view them from our narrow standpoint.